Gold is likely to remain highly volatile in the next couple of weeks on the US Fed’s imminent interest rate hike scheduled to be announced on Wednesday. Gold price, being inversely proportional to the economic growth, is set to move in the range of $100 until the first week of January 2016. Trade sources anticipate two kinds of scenarios emerging for gold price movement. First, in case US Fed raises interest by 25-50 basis points, gold price would initially decline as a knee-jerk reaction. But, some trades might see this as an opportunity for entering in the gold space for longer -term prospects. So, gold price may recover later. Second, traders are currently awaiting the US Fed’s move. So, more than interest rate hike, the language of the US Fed citing reasons would be important. In case of a dovish stance for future interest rate, traders might continue to see gold as a hedge against weak economic growth and, therefore, they might increase their gold holding. But, in case of a hawkish stance, however, traders might sell their holdings and proceed on the Christmas and the New Year leaves. “More than US Fed’s quantum of interest rate hike, its language on US economy is important. After initial knee-jerk reaction, gold will settle down with visible range between $1,020 (Rs 68,492.44) and $1,120 (Rs 75207.38) an ouonce for the next couple of weeks,” said Gnanasekar Thiagarajan, director, Commtrendz Research. 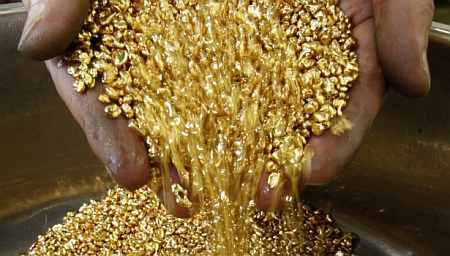 Barring a couple of temporary ripples either side, the gold price moved in a close range for over one month to settle at Rs 25,770 per 10g in the popular Zaveri Bazaar here on Saturday. In global markets, however, gold recorded a marginal $10 (about Rs 671) decline to close on Friday at $1074.74 (Rs 72168.20) an ounce. Following broad-based trend in industrial commodities, silver recorded a decline of $0.41 to close on Friday at $13.92 translating thereby Rs 33,970 a kg in rupee term. “Therefore, the next week would be crucial for bullion traders. Traders are closely monitoring the US Fed’s announcement,” said Thiagarajan. Meanwhile, gold price slumped to one-week low on Friday morning in the US. Gold for delivery in February was reported down by $7.70 or 0.7 per cent to $1,064.30 per ounce on the Comex division of the New York Mercantile Exchange. Trade has ranged from $1,061.70 to $1,072.50 an ounce. Traders have been reticent to wade into the market before the Federal Open Market Committee convenes next Tuesday and Wednesday. With the US central bank widely expected to raise the federal funds rate for the first time in nearly a decade, volumes have fallen to an daily average of roughly 135,000 compared with nearly 160,000 in the previous week. Interestingly, Bank of America Merrill Lynch Global Research, in a research note, said, “Gold has faced persistent headwinds, as dollar, real rates, commodity prices and volatility have all not incentivised investors to increase their exposure to the metal. As for speculative positioning, gold ETF holdings tumbled to a new 2015 low of 1,486 tonnes as of December 4, with investors liquidating 44 tonnes in November. Silver price on the Comex for delivery in March declined 31.0 cents or 2.2 percent to $13.800 per ounce. Trade has ranged from $13.750 to $14.135. Anuj Gupta, assistant vice-president, Angel Commodities Broking expects gold prices to find support in the range of Rs 25,200 - 25,300 per 10g. Trading consistently below this level would lead towards the strong support at Rs 24,900 per 10g and then finally lower further.